How it Works: EARN 1 point per $1 spent. Let's say you spend $500 throughout the year. That's 500 points. Now you have $10 that you can use toward goodies for you, your horse, & your pet! • No cash value for points. Points cannot be used for gift cards. • Points may not be used towards tax/shipping/freight - only product cost. • Points may not be redeemed on hay, feed, bedding, vaccines, flea products, de-wormers, or consignment saddles. • Points are earned on all full priced items. 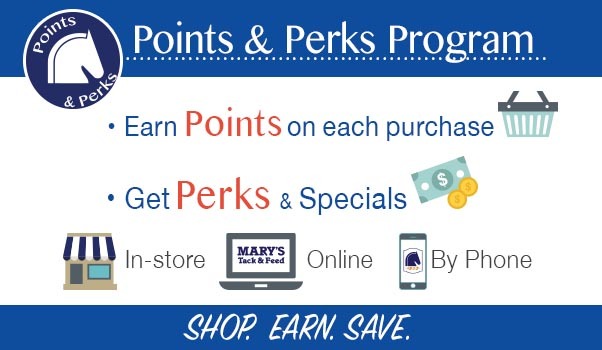 • Some exclusions apply - Mary's reserves the right to change the parameters of Points & Perks Program at any time.